After extensive research and implementation, Thrive Dentistry OnSite™ offers a convenient way for both the Assisted Living Facility and its residents to experience the best in oral care. Our advanced mobile equipment and staff can be moved into a facility, set up to treat patients and then removed at the end of the day. Patient Assessment: initial exam by the dentist, full mouth x-rays and charting, screening for oral cancer & periodontal disease and developing a treatment plan. Founder Don J. Ilkka, DDS had personal family experience the effects of lack of oral health care in a memory care facility. He became a passionate champion to rectify the status of care for residents of Assisted Living/Memory Care facilities. After several years of field research and development, Thrive Dentistry OnSite™ was created. Its mission is to improve and manage the oral health of Assisted Living/Memory Care residents, allowing them to live healthier and happier lives, through the services of mobile dentistry. Dr. Ilkka received his B.S. from Michigan Technological University and is a graduate of the University of Detroit School of Dentistry. 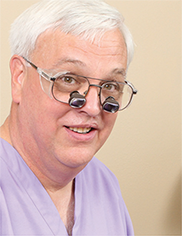 He started his practice in Leesburg, Florida in 1982. Dr. Ilkka Served on the Board of Trustees for the Florida Dental Association and is the liaison between the Board and the Florida Board of Dentistry. In addition, he is an Adjunct Assistant Clinical Professor at the University of Florida School of Dentistry. Dr. Ilkka also volunteers with St. Luke's Medical & Dental Clinic in Eustis, Florida as its Dental Director. Thrive Dentistry OnSite™ was created to meet the oral needs of residents right where they live, providing them optimum quality of life. According to the PEW Foundation, Assisted Living/Memory Care residents are on of the least served groups for dental care. Researchers have found that there are oral symptoms for many diseases. With careful examination of the teeth, gums and tongue, dentists have found evidence of: cancer, heart and liver disease, eating disorders, diet deficiencies, anemia, and diabetes.